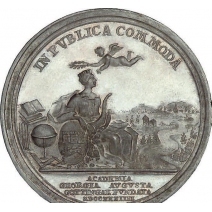 "For the good of all"
IN PUBLICA COMMODA - "For the good of all".... is written on the University's founding medal from 1737. This motto also guides Alumni Göttingen. We aim to bring together alumni, supporters, former and current students to develop impactful, mutually beneficial relationships. All - that also includes our partner institutions of the Göttingen Campus and our medical school.